With some people, you just click. The connection is quick and easy. Communication flows. You can tell them anything and they know just what you mean. When you connect in this way, you feel understood and accepted for who you really are. You "get" these people and they get you. We think of this connection as an instantaneous thing, something that either happens or doesn't. Not so, says author Dr. Rick Kirschner. This connection isn't a magical phenomenon; it's a communication skill that can be learned with specific steps and techniques. 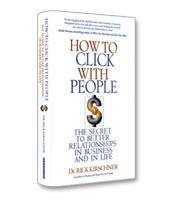 One day, Rick Kirschner, author of How to Click With People, was having trouble clicking with a surly convenience store clerk. Kirschner wanted dairy creamer for his coffee, but only nondairy creamer was in sight. "I really dislike nondairy creamer. How about you?" Kirschner asked nicely. The clerk snarled that he "liked it just fine." Kirschner tried to be a little playful: "Do you have milk, cream, half-and-half — you know, anything from a cow?" "No" came the aggressive reply. Kirschner’s quiet request for maybe a spoonful of ice cream in his coffee to take the edge off was met with another sharp "No." Suddenly, Kirschner realized why he wasn't clicking. His body language was all wrong. The clerk wasn't holding a coffee, wasn't smiling, wasn't being playful. Kirschner set down his coffee, crossed his arms and asked the clerk: "Is this something I did, or are you just having a rough day?" Immediately, the clerk began telling Kirschner how the night shift had left a huge mess for him, how he had spent hours cleaning the store and how his back was killing him. The clerk paused, then asked, "What flavor?" Kirschner was able to make a connection with the unhappy clerk through the use of what he calls "blending": finding patterns of similarity with other people. People connect, or "click," when they have a sense that, in some way, the other person "is like me." Blending is often a subtle adaptation in posture, gesture, tone, space (how much personal space a person needs) that can go a long way to breaking down barriers between people. Blending is just one of the many techniques and approaches that Kirschner offers in this short but comprehensive book on how to create substantive connection with others. For example, he describes how people communicate with one of four communication styles: action, accuracy, approval and appreciation. To click with an action-based individual, Kirschner writes, you must be assertive and direct. An approval-based individual, on the other hand, will be put off by pushy, direct people. Another chapter describes how understanding the six types of motivation will help you click with others. For example, Kirschner writes, some people are primarily motivated by their values — by what they believe to be right or wrong. Values-motivated people tend to see the world in black and white, and tend to see their actions and opinions as just, reasonable and fair. Phrases such as "You really should consider this" or "It seems only fair that you hear me out," will strike a chord with values-motivated people. By contrast, someone motivated by challenge will respond better to phrases that involve success and a can-do spirit. "Here's what we can do" or "We can't let this moment pass us by" are effective phrases in this case. Other motivations include reward, esteem, purpose and feelings. In each case, matching the interaction or communication approach to the motivation type of the other person will greatly enhance the connection. Other chapters offer a variety of tactics for dealing with difficult people, outline the seven signals that readers can use to help sell their ideas (signals such as authority, conformity, consistency and scarcity), and describe how to overcome the nine stumbling blocks that can destroy any attempts at communication — among many other how-to lists and pointers. In How to Click With People, Kirschner avoids generalizations and platitudes to give readers a full toolbox of actions and strategies to help them click with others.